Online access to digitized historical primary sources and secondary source analysis has changed the way historians work and teach. For me, this week was an excellent reminder that these online resources have opened up many more possibilities for my teaching and my scholarship. 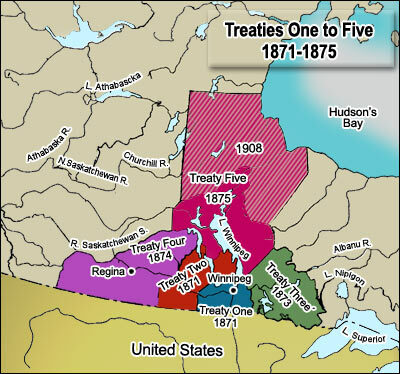 Monday was the 135th anniversary of the signing of the Lake Winnipeg Treaty, the fifth of the so-called “Numbered Treaties.” This semester, my students have the choice of writing a short essay on the history of this treaty and I was able to provide them with a digital copy of the text of Treaty Five, available online through the Early Canadiana collection. I was also pleased to hear Professor Jarvis Brownlie on Monday’s episode of Today in Canadian History, discussing Treaty Five and the broader history of the Western Canadian Numbered Treaties. I also discovered that the Department of Indian and North Affairs offers a useful online guide for understanding Treaty Five. It was one of those perfect internet storms. The expansion of digital content for Canadian historians in just the past few years has widened the avenues for our research and our teaching to incredible proportions. The sheer volume of digitized historical primary sources alone has restructured my assignments as well as my expectations for student research. Digital literacy is rapidly becoming a fundamental skill for undergraduate history majors. The same is true for their professors.